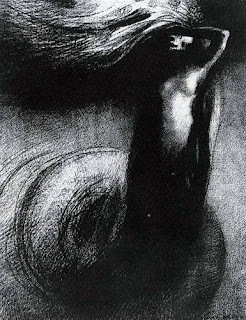 Excerpt from Dark Dreamer by Danielle O'Steen: "In the 1870s, Redon concentrated on charcoal drawing, and his works in that medium are known as the noirs, not only because of their predominant black tone but also their dark mood. He had suffered from epilepsy as a youth, and his family, ashamed of the affliction, sent him away at an early age to live with an uncle. That separation haunted Redon, and was embodied in his noirs. He referred to the drawings as mes ombres ("my shadows," or "my ghosts") because of their highly personal nature and otherworldly subjects." 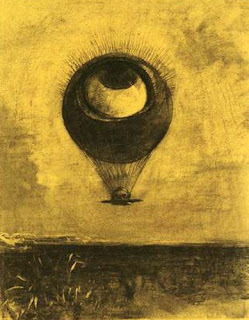 Odilon Redon, Eye-Balloon, 1878, charcoal and chalk on colored paper, 16 5/8 x 13 1/8 in., source: The Museum of Modern Art. 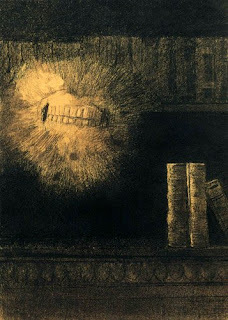 Odilon Redon, Vision: Berenice's Teeth, c. 1885, charcoal on paper, 51.2 x 36.6 cm. source for image and quote: The Enchanted Stone: The Graphic Worlds of Odilon Redon, by Ted Gott, published by the National Gallery of Victoria, 1990. Drawing based on Edgar Allan Poe's "tale of a madman who becomes obsessed with the perfection of his cousin Berenice's teeth: 'Would to God that I had never beheld them, or that, having done so, I had died!' In a fit of violence he kills her by ripping the teeth out of her head with his bare hands... The drawing does not so much illustrate Poe's tale as comment on the very pleasure of reading his chilling words: 'The teeth! the teeth! - they were here, and there, and everywhere, and visible and palpably before me!'" 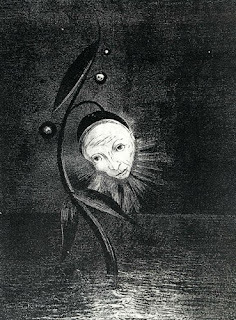 Odilon Redon, Death: My irony outstrips all others!, 1889, lithograph on chine appliqué, 26.1 x 19.6 cm. source: The Enchanted Stone: The Graphic Worlds of Odilon Redon, by Ted Gott, published by the National Gallery of Victoria, 1990. 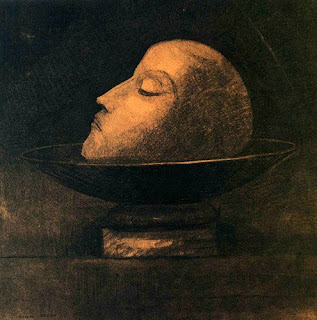 Odilon Redon, Head of a Martyr, c. 1875-80, charcoal on paper, 37 x 36 cm. source: The Enchanted Stone: The Graphic Worlds of Odilon Redon, by Ted Gott, published by the National Gallery of Victoria, 1990. 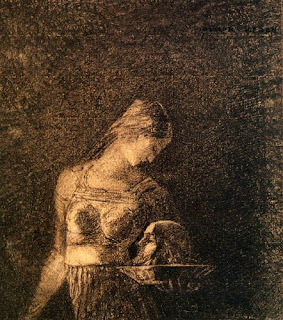 Odilon Redon, Salome with the Head of John the Baptist, c. 1880-85, charcoal on paper, 21.2 x 18.5 com. source: The Enchanted Stone: The Graphic Worlds of Odilon Redon, by Ted Gott, published by the National Gallery of Victoria, 1990. Odilon Redon, The Marsh Flower (No. 2 of Hommage a Goya), 1885, lithograph on chine appliqué, 10 3/4 x 8 1/16 in. source: The Graphic Works of Odilon Redon, Dover Publications, 2005.